The Space Foundation’s annual Space Symposium provides an opportunity for global space professionals to hear firsthand about how industry decisions are made and the possible global impact of those decisions. Marillyn Hewson, the Chairman, President and Chief Executive Officer of Lockheed Martin. 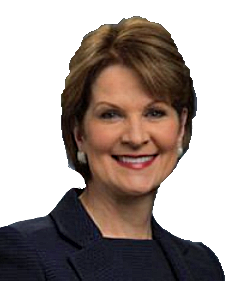 Marillyn Hewson, Chairman, President and Chief Executive Officer of Lockheed Martin, will address the importance of space to the economy and the future, as well as the critical role of strategic investment and innovation for positively shaping the final frontier. Hewson will speak on Tuesday, April 17, at 2:00 p.m. Mountain Time in The Broadmoor’s International Center, as part of the main Symposium agenda. In her more than 30 years with Lockheed Martin, Hewson has held a variety of increasingly responsible leadership positions, including President and Chief Operating Officer and Executive Vice President of the Electronic Systems business area. Hewson currently sits on the Board of Directors for DowDupont. She is a former Chair and current Member of the Executive Committee of the Aerospace Industries Association, a Fellow of the Royal Aeronautical Society, an Associate Fellow of the American Institute of Aeronautics and Astronautics, and a Member of the International Institute for Strategic Studies. Hewson also serves on a number of other non-profit and advisory boards. In 2017, Fortune magazine identified Hewson as No. 3 on the "50 Most Powerful Women in Business." She has also been recognized as a Top 10 "Businessperson of the Year" by Fortune, as one of the "World's 100 Most Powerful Women" by Forbes, and as one of the "Bloomberg 50" — the leaders who defined 2017.